04.19.2011: US, Ann Arbor, Michigan Theater. See the Ron Asheton Foundation webpage http://www.ronashetonfoundation.org/ and press release on this site's news page. Tickets went on sale Feb. 18th and sold out. 05.28.2011: UK, Newcaste, Evolution Festival. Tickets here. 06.11.2011: UK, Isle of Wight, Isle of Wight Festival. Tickets sold out. 06.15.2011: Italy, Milan, Rock in IdRHO Festival. Tickets here. 06.17.2011: France, Clisson, Hellfest. Tickets here. 07.02.2011: UK, Paddock Wood, Kent, Hop Farm FestivalTTickets here. 07.03.2011: UK, Cheshire, Chester Racecourse, Chester Rocks Festival. Tickets here. 07.07.2011: Portugal, Lisbon, Optimus Alive Festival. Tickets here. 07.09.2011: Spain, Valencia, Jardin De Los Viveros. Tickets here. 07.23.2011: France, Corsica, Patrimonio Nuits De la Guitare. Tickets here. 07.27.2011: Carcassonne, France, Festival de Carcassonne. Tickets here. 07.29.2011: Belgium, Tienen, Suikerrock Festival Tickets here. 07.31.2011: France, St. Julien en Genevois, Guitare en Scene. Tickets here. 08.12.2011: Germany, Rothenburg, Taubertal Festival. Tickets here. 08.13.2011: Germany, Eschwege, Open Flair Festival. Tickets here. 08.20.2011: Norway, Bodo, Parken Festival. Tickets here. TBA US, Las Vegas, The Joint @ The hard Rock Hotel and Casino. Tickets here. 12.01.2011: US, Los Angeles, Hollywood Palladium. Tickets here. 12.04.2011: US, San Francisco, The Warfield. Tickets here. 12.06.2011: US, San Francisco, The Warfield. Tickets here. 03.15.10: Iggy and the Stooges inducted into the Rock Hall of Fame, Waldorf Astoria, NYC, LIVE Fuse TV! 5.28.09: Iggy Pop: live performance on France Inter radio on May 28th at 9pm CEST Video here! 6.08.09: BBC's Radcliffe & Maconie show interview recorded, email questions to Iggy! 9.05.09: James Williamson plays with Careless Hearts at the Blank Club, San Jose, California. Tix! See all Mike Watts show dates here at the Hootpage. 08.28.08: Zitadelle, Citadel Music Festival, Berlin, Germany. 09.13.08: St. Nolff Festival, Au Coin Du Bois, Kerboulard - St Nolff, France. Friday, March 16th: More Stooges events at SXSW! There is the live KEXP from 1-1:45 and audience is first come first served. 300 capacity. KLCU studios. Live on Indie 103.1 w/ Steve Jones from 2:20 - 2:40pmThe Stooges will be featured for SPOTLIGHT/Q&A w/ David Fricke @ Austin Convention Center @ 3:30pmAnd the Waterloo in store from 6 - 7. First come first served until capacity. Attention Southern California Stooges fans! Want to be a part of an exclusive major LIVE internet event with Iggy & the Stooges. Yahoo! Music and the Capitol Music Group want you to join us when the Stooges take the stage for Nissan Live Sets in West Los Angeles, CA! 05.27.07: Pinkpop, the Netherlands. MANY videos here. 12.01.07: Corona Music Fest 2007, Mexico City, Mexico. Reviews: Pix: 1 Video: 1 2 3 more! 12.05.07: Art Basel Miami Beach, South Beach, Florida. Reviews: 1 2 3 4 5 Video: 1 more! 12.02.06: Taskirat Festival, Skopje Fair, Macedonia. Review: 1 Iggy meets with Prime Minister! 12.05.06: Riga Arena, Riga, Latvia. interview with Ron inlocal languge here. 12.8+10.06: ATP: The Nightmare Before Christmas, Somerset, UK. 3 day schedule here. 06.02.06: Papillons de Nuits Festival, Saint-Laurent-de-Cuves, France. 09.22.06: Pepsi Music 2006, Buenos Aires, Argentina. 01.20.06: Big Day Out: Auckland, New Zealand. Many articles, reviews here. 01.22.06: Big Day Out: Gold Coast, Australia. 01.26.06: Big Day Out: Sydney, Australia. 01.29.06: Big Day Out: Melbourne, Australia. 02.03.06: Big Day Out: Adelaide, Australia. 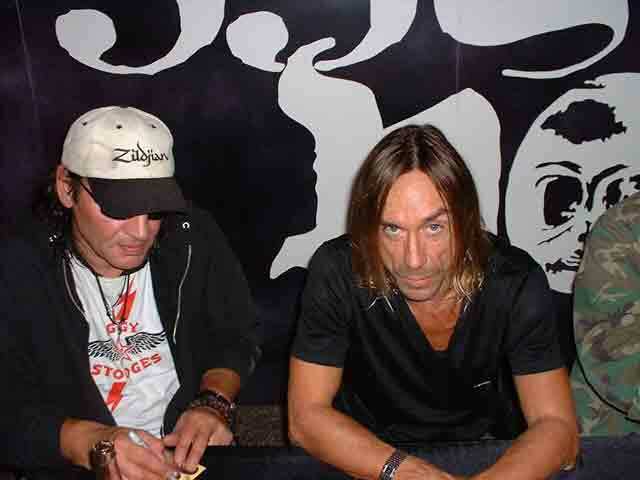 Iggy and the Stooges: 2005: Europe, US. 07.16.05: Musilac Festival, Aix Les Bains, France. 07.17.05: Talavera de la Reina, Albacete, Spain. 08.26.05: Leeds Festival 2005, Bramham Park, Wetherby (near) Leeds, Yorkshire, UK. 03.19.04: Osaka ACT Hall 2-1-10 Minami-Kohoku, Osaka, Japan. 03.20.04: Nippon Convention Center, Chiba, Japan. 07.02.04: Skelleftea Festival, Sweden. Reviews: 1 2 3 4 5 Video Ron's video interview. 10.22.03. Churchill's, Miami, FLA. 2nd version video shoot of "Little Know It All." Video here. 11/04/03: Newbury Comics, 211 Alewife Stooges. 11/06/03: The David Letterman show, 11:35PM EST. Sum 41. Video here. 11/09/03: All Tomorrows Parties, the Queen Mary Ship, Long Beach, CA. Stooges. 11/26/03: The CASBY AWARDS, Koolhaus,Toronto. Canada. Sum 41. 11/11/03: Iggy will host the Seattle Deck The Hall Ball, radio interviewon 107.7 FM. 12.12.03: Radio interview, San Francisco: Live105.3 FM. 12.14.03: WBAI-FM Fundraiser, NYC. Scheduled for afternoon, stay tuned. 12.14.03: New Rock 97.3FM, Cincinnati, OH show at Jillians: Storytellers performance.Trolls. 2003 Touring Schedule 2003 press and review page here. Entirely new page all about the Stooges' reunion at Coachella here. 06/15/03: Freilichtbühne Stadtpark, Ecke Jahnring/Saarlandstraße 22299, Hamburg, GER. 7PM. 06/17/03: Bank Austria Halle (Gasometer) Vienna, Austria. bully's eview and pix here. 06/27/03: FleetBoston Pavillion, Boston, MA. 6pm. Thanks Chris! Reviews and pix here..
07/04/03: Isladencanta Festival, Mallorca, Spain. Manel's setlist and review here. 70/05/03: Rock Zottegem Festival, Zottegem, Belgium. 07/26/03: Mt. Fuji Festival, Nigata Ski Resort, Japan. 08/08/03: Tommy Hilfiger at Jones Beach, Wantagh, NY. Stooges. Preshow press: here. 08/25/03: DTE Energy Music Theatre, Sashabaw Road, Clarkston, Stooges. 08/27/03: Roseland Ballroom, 239 West 52nd Street, NYC, N.Y. 8pm. Lifebeat Benefit. Stooges. 09/12/03: Vitoria-Gasteiz Azkena Rock Festival 2003, Vitorio-Gasteiz, Spain. Stooges. 09/13/03: Bol d'Or, Magny-Cours circuit, France. Stooges. October 30, 2002: NO new tourdates. New CD in progress. First dates of Iggy Pop's 2002 touring schedule announced. 2002 Touring Schedule Previews, reviews, pix from 2002 tour here! 6/15/02: The Norwegian Wood Festival, Oslo, Norway. Iggy headlines. Dirt's pix. 7/07/02: Krylya Rock Festival (Wings). Tushino Airfield, Moscow, Russia. 7/12/02: Esparrago Festival, Cádiz, Spain. 22:15 pm. 7/13/02: Brixton Academy, London, UK. Doors 6:30 pm. 7/15/02: The Olympia Theatre, Dublin, Ireland. Great venue website - 3D! Doors 7:30 pm. 7/17/02: Barrowlands, Glasgow, Scotland. Doos 19:30. 7/19/02: Distortion 2002 Festival, Cardiff, Wales, UK. Bute Park in the shadow of Cardiff Castle. 7/20/02: Distortion 2002 Festival, Wollaton Park, Nottingham, UK. 7:30pm-8:45pm. Main stage. 7/21/02: Festival Des Vieilles Charrues, Carhaix, France. Scène Glenmor 13:30. 7/23/02: Theatre Antique de Vienne, Vienne, France. 20:00. 7/25/02: Grona Lund, Stockholm, Sweden. 19:30. Dirt's pix. 7/27/02: Suikerrock Festival, Tienen, Belgium. Main stage (headliner) 22.15-24.00. .
7/31/02: Big Beat Festival, Cagliari, Sardinia, Italy. Mountain Claro Park, 22:00. 8/02/02: Sziget Festival, Hajógyári Island, just north of Budapest, Hungary. 21:30. 8/04/02: Rock On Rock, Sports Center, Krk Island, Croatia. Doors 19:00.
aggro-core "L.O.S.T," "Beat 'Em Up," "Howl" and "Mask." there would be some "ranting on the album, some humor, some rock on it." through the rest of the year. "We plan to do lots of touring this year," Collins says. "Beat Em Up" CD reviews here, 2001 interviews here. 4/25/01: Cajun House, Scottsdale, AZ. 8pm. Reviews, setlist, pix. 4/27/01: 4th & B, San Diego, CA. 8pm. Reviews, setlist, pix. 4/28/01: The Coachella Valley Music Festival, Indio, CA. Review, pix. 2nd review. 4/29/01: The Fillmore. San Francisco, CA. 8pm. Interview: San Francisco Gate. Review. 5/16/01: First Avenue, Minneapolis, Minnesota. 9:30 pm. 5/18/01: Vic Theatre, Chicago, Illinois. 8pm. Setlist. 5/19/01: The Canopy Club, Urbana, Illinois. 10pm. 5/20/01: State Theatre, Detroit, Michigan. 7:30pm. Review: Detroit Free Press. Setlist. 5/22/01: Club 5, Jacksonville, Florida. 8pm. 5/23/01: House of Blues, Orlando, Florida. 9pm. 5/25/01: Jannus Landing, St. Petersburg, Florida. St Petersburg Times. 5/26/01: Atlantizz, Fort Myers, Florida. (otherwise known as the Orbit) 9pm. 5/27/01: Culture Room, Ft. Lauderdale, Florida. 8pm. 6/15/01: NPA TV, Paris, France. Interview and material from "Beat Em Up." 1900. 6/19/01: The Priory, UK TV. 6pm. Tickets still available as of 6/15. 6/22/01: The Harald Smith Show, German TV. 23:15. 6/23/01: Jonathan Ross Show, BBC. Interview: Audio file online. 6/24/01: MTV Hurricane Festival, Hauptbühne, Germany. 18:45 to 19:45. 7/07/01: Solidays: Aids Benefit: Paris, France. 22h to 23h. 7/08/01: Eurokeennes de Belfort, France. 23:00 to 00:30. Europe with dates in Switzerland, Belgium, Germany and the UK. 8/16/01: Rock Oz´Arenes Festival, Avenches, Switzerland. Grande Scene. 8/17/01: The Comet Music Awards, Cologne, Germany. Iggy presents an award to Him. 8/18/01: Alive Festival, St Vith, Belgium. Midnight. 8/19/01: Bizarre Festival, Airport Weeze, County Kleve, Germany. 18:00. 8/21/01: Parken, Copenhagen, Denmark. 20:00. 8/24/01: Reading Festival, Reading, UK. 8/25/01: Leeds Festival, Leeds, UK. 8/26/01: Gig on the Green, Glasglow Green, Scotland. below the Mason-Dixon line for the month of October and heading north in November. members of Pop's band. The album is dedicated to its bassist, Lloyd "Mooseman"
an audio stream of the album's first track, "Mask." 10/18/01: 40 Watt Club, Athens, Georgia. 9pm. Sold out. 10/19/01: Cat's Cradle, Carboro, North Carolina. 9:30pm. Sold Out. Poster. 10/20/01: The Music Farm, Charleston, South Carolina. 10pm. 10/23/01: New Daisy Theater, Memphis, Tennesse. 7pm. 10/24/01: The Pageant, St. Louis, Missouri. 8pm. Sold out. 10/25/01: Uptown Theatre, Kansas City, Missouri. 7:30pm. 10/27/01: Five Points Music Hall, Birmingham, Alabama. 10/28/01: Earthlink Live Center, Atlanta, Georgia. 7pm. 10/29/01: Tremont Music Hall, Charlotte, North Carolina. 8pm. 10/31/01: The Norva, Norfolk, Virginia. 8pm. 11/01/01: The Recher Theatre, Towson, Maryland. 7pm. 11/02/01: The 9:30 Club, Washington, D.C. 11pm. Graeme's pix. 11/04/01: M (Metropol), Pittsburgh, Pennsylvania. 7pm. 11/06/01: Theatre of the Living Arts, Philadelphia, Pennsylvania. 8pm. 11/08/01: Toad's Place, New Haven, Connecticut. 7:30pm. 11/09/01: The Avalon, Boston, Massachusetts. 7pm. 11/10/01: Lupo's, Providence, Rhode Island. 8pm. 11/12/01: Irving Plaza, NY, NY! 8pm. Sold out. 11/13/01: Irving Plaza, NY, NY! 8pm. Sold out. 5/23/00: Torwar Hall: Warsaw, Poland. 7/09/00: T in the Park Festival: Balado, near Kinross in Perthshire, Scotland. 7/13/00: Santirock2000: Santiago de Postela, Spain. 7/14/00: Midsummer Concert On the Beach: Zeebrugge, Belguim. 9/01/00: Rock am See Festival: Losheim, Germany. Millenium Tour 2000: Pix, reviews. 9/03/00 Grosse Freiheit 36: Hamburg, Germany. 4/30/99: Jannus Landing: St. Petersburg, Florida, USA. 7PM. Read reveiw here from the St. Petersburg Times. 5/1/99: Music Midtown Festival: Atlanta, Georgia, USA. 10:45- 12MN. 5/2/99: Cameo Theatre: Miami Beach, Florida, USA. 8PM . 6/19/99: City Stages Festival: Birmingham, Alabama, USA. 10:25pm. 7-9/99: Midtfyn Festival: Odense, Denmark. 7/10/99: Solidays: Aids Benefit at the Hippodrome: Paris, France. 7/11/99: Theatre Romain de Fourviere: Lyon, France, what a venue! 7/13/99: Patinoire: Briva La Gaillarde, France. 7/16/99: Festival: Braga, Portugal (note date changed from 8/99). 7/20/99: Festival De Coreggio: Italy. 7/24/99: The Zenith: Munich, Germany. 7/25/99: The Paleo Festival: Nyon, Switzerland. 9/30/99: The London Astoria (LA2), London, UK. 10/25+26/99: The El Ray Theatre, LA, CA, USA. Review. Pix here. 10/28+29/99: Metro, Chicago, Illinois, USA. 11/30/99: The Warehouse, Toronto, Canada. 11/1/99: Avalon, Boston , MA, USA. 11/4+5/99: Irving Plaza, NYC, New York, USA. 8pm. Reviews here and here. 11/8+9/99: L'Elysee Montmarte, Paris, France. Review here. 11/21+22/99: The Circus, Stockholm, Sweden. 11/26/99: Die Kantine, Köln, Germany. 11/29/99: Grosse Freiheit 36, Hamburrg, Germany. 12/1+2/99: Ancienne Belgique, Brussels, Belgium. 12/4+5/99: The Paradiso, Amsterdam, Holland. 12/7+8/99: Sheperds Bush Empire, London, UK. Reviews here and here. * Please email me any dates you may find so they're added to the list. Many of the shows listed above are available for TRADE ONLY at Dirt's Iggy Pop Tradelist.